Austin Tourist Bureau was a community project that responded to a mother in the neighborhood that said to me that ‘no one comes to the Austin community except to go home’. 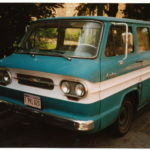 The tour bus was a 9 passenger 1964 turquoise Chevrolet Corvair Van. The Austin Tourist Bureau was developed to initially introduce area residents to specific sites in their community through random-guided tours. 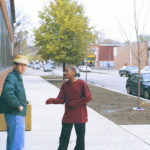 The project evolved to accommodate events and other artist workshops through the Stockyard Institute throughout 2003.